This past week I was lucky enough to enjoy the beautiful Universal Studios Orlando as well as the scary, world famous, Halloween Horror Nights (HHN). I was told this year's HHN was one of the best yet. With the street experience being based off of the famous show, The Walking Dead, and boy did those "walkers" scare me good a few times. Sunday and Thursday are the cheapest days to go, followed by Friday and the most expensive is Saturday. Adding Scare & Scream discounts your HHN ticket. By far the best value is Frequent Fear. 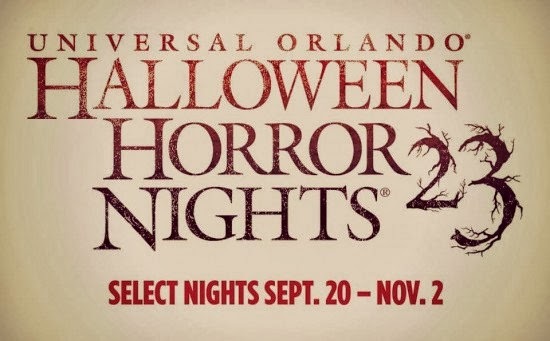 This allows you to go to multiple Halloween Horror Nights for one low price. Only have one night to enjoy HHN? This will help you bypass all those awfully long lines. I recommend adding Scare & Stay to your Universal ticket. Not only will the HHN ticket be cheaper it will allow you to stay in the park while they "flip it." Alan and I didn't purchase park-hopper so we stayed at Universal Studios the whole time, but you have the option to add it to a park-hopper ticket and spend the 1.5 hours of transition time at Islands of Adventure. I found it beneficial to just stay at Universal because once they are ready they release you into the park and you basically get to walk through the first coupon haunted houses that are immediately opened. Even though they said it was going to be a five minute wait, it was more like zero. Some of the houses don't open up right away for those that Scare & Stay. I remember they released us before 6:30PM and only two houses were open. We ended up walking around after going through the first two houses within 15 minutes just to wait for Evil Dead to open up at 6:30PM. What was awesome about our time that we just walked around was it was early enough that there was still light and we really got to soak in how they turned the park into scenes from The Walking Dead. This cup is AWESOME, but again this doesn't carry over during Halloween Horror Nights. So no free unlimited refills from the awesome Coke Freestyle machines, only $0.99 ones. Take your pictures early!!!! I cannot stress this enough. Once it gets dark there is so much fog from the fog machines that it makes it nearly impossibly to get a good photo, even by the professionals on site. RIP Tours basically allows you through all the houses and you get to go through the Fast Pass line and tour guides. RIP Tour pricing and availability vary depending upon the date and event hours. In order of my favorites! At the park right now or heading there? 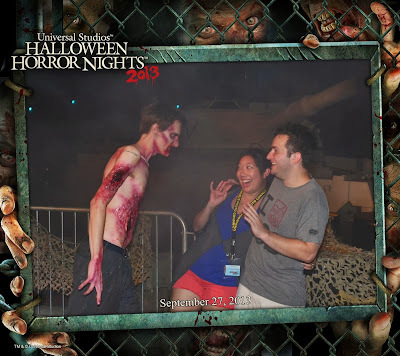 Our one good picture from Halloween Horror Night 23!